and a heuchera sneaking in the corner ! Beautiful Terra, looks well established. Thank you Amy ... a lovely comment ! Thanks Sandra and Michaella .. This is really a gardening mastership. 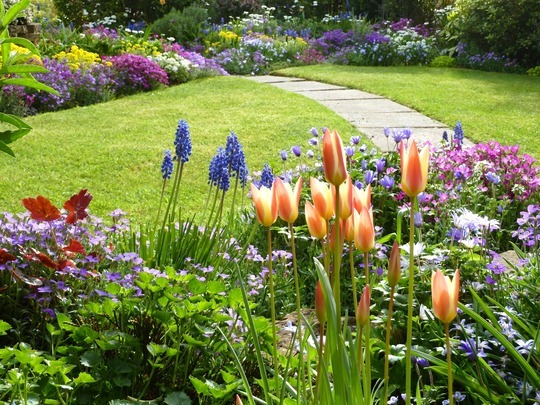 Terra, this is very pretty .... Lovely array of colours, lawns nicely edged. Time for a well earned cup of tea in the deckchair, by my reckoning. I'm lucky that these plants like the growing conditions in my front garden. TT fantastic pic, you are obviously very green fingered. Ten out of ten for being such a clever clogs. What a beautiful Spring garden Terra. Plenty of colour and lots for the early insects to have a feed at. The longer stem flowers in the foreground are tulips and grape hyacinths. The mauve clusters are various shades of aubrieta. I hope this helps ... good luck with your garden. Lovely, everything looks so fresh this time of year doesn't it? Hi Skilla and Maggie ..
thanks ... I have 2 dogs ..
Amazing. This is the goal I will never reach, Terra. Excellent. I wish it was my garden, it's beautiful. There are people in California who would give an eye tooth for that garden. Its straight out of a Miracle Grow commercial!. Hello, Terra, could you please make a snap now in the winter from the same view? I wonder, if you combined more seasons flowers. I am sure, you did :-) Noris said hello to Conker, he looks like a happy gardener. This past October I gave my front garden a make-over ... so there are plenty of up to date photos on my recent blogs ..
29th October Jewels Between Rocks and Hard Places. OK, will have a look at it. I haven t been on the GoY for some time.